Have you heard the good news? After months and months of drivers eagerly waiting to get their hands on the 2019 Chevrolet Tahoe, they finally can at Broadway Automotive in Green Bay! 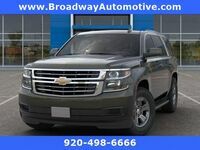 That’s right, the latest edition of the widely-popular Chevy large SUV is finally here, and drivers can get an up-close look and test drive it at Broadway Auto! If you’re looking to learn more about the 2019 Chevy Tahoe, you’ve come to the right place! The 2019 Chevy Tahoe is for those drivers that sometimes just need a lot of space! 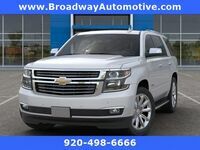 Great for large and growing families, the 2019 Chevy Tahoe has been one of the most popular models in its class and in the Chevy lineup for years. What can drivers expect for the 2019 edition? We're going to tell you in our model research breakdown of everything about the 2019 Tahoe from its performance specs to its safety technologies! Let’s see what the 2019 Tahoe can do! No better place to begin our breakdown than underneath the hood! The 2019 Chevy Tahoe has two different engines for drivers to choose from. First, there’s the 5.3-liter EcoTec3 V8 that offers robust power with 355 horsepower and 383 lb-ft of torque to go along with solid efficiency with 22 mpg highway. Then, for those that need more, there’s the 6.2-liter EcoTec3 V8 that offers an incredible 420 horsepower and 460 lb-ft of torque! On the interior, the 2019 Chevy Tahoe offers the incredible space drivers expect from a large SUV, with up to 94.7 cubic feet of cargo space with the seats folded down. They’ll also find numerous convenient features to make the driving experience better for everyone including a hidden lockable storage compartment for safekeeping and up to seven USB ports so everyone can plug in! Of course, like all Chevy vehicles, the 2019 Tahoe also offers numerous advanced technology features for entertainment and convenience that make for a more enjoyable driving experience. Like the Apple CarPlay and Android Auto functionality for easy smartphone integration, the available Chevrolet 4G LTE Wi-Fi and Rear Seat Entertainment System with Blu-ray playback! Want to learn more about the 2019 Chevy Tahoe? Ready to get behind the wheel of one? Contact our staff at Broadway Automotive for more information or to schedule a test drive today!